Every day is father's day – at least for Sandro, Bernd and Oliver, after having decided, for different reasons, to stay at home with their kids for longer than a year while their wives go to work. Even in our supposedly emancipated society, this is not an easy decision, and it is not easy task, either. 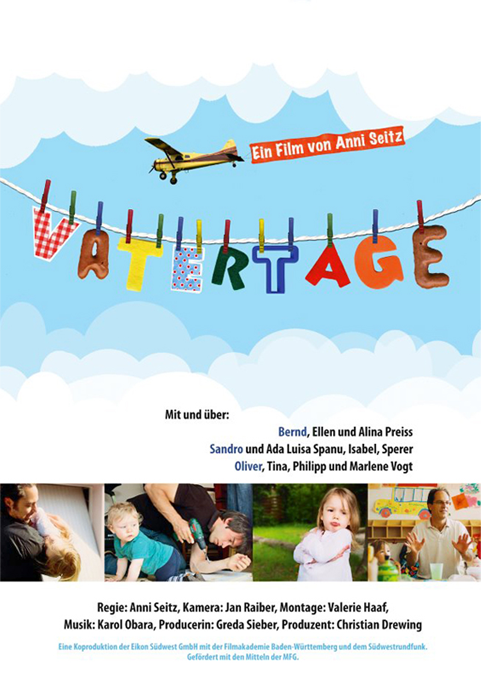 The film follows the three men through the ups and downs of their daily life in and around the city of Stuttgart. With great honesty, they talk about coming to terms with their new roles as stay-at-home dads and coping with society's reactions. It is especially the older generation of their own fathers that still find it hard to accept their sons as house-spouses. The kids, on the other hand, whose often funny and sometimes poetic perspective are captured with great sensitivity, readily accept it as a given. Between the different perspectives and positions, a humorous and highly entertaining panorama of contemporary family life unfolds that yet manages to address some of the bigger questions concerning education, role-models, and responsibility. Die Internetseite der Seitz GmbH Filmproduktion enthält aufgrund von gesetzlichen Vorschriften Angaben, die eine schnelle elektronische Kontaktaufnahme zu unserem Unternehmen sowie eine unmittelbare Kommunikation mit uns ermöglichen, was ebenfalls eine allgemeine Adresse der sogenannten elektronischen Post (E-Mail-Adresse) umfasst. Hinterlassen Sie uns einfach eine Nachricht, in der Sie der Datenspeicherung widersprechen. A co-production between Eikon Südwest GmbH with Filmakademie Baden-Württemberg and Südwestrundfunk.